I'm the one owning the banjokazooie masterpiece WiiU gamepad with a core m5 in it. 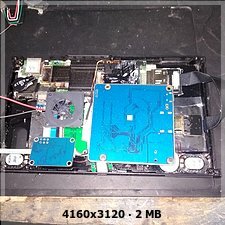 Now that Nintendo Switch pieces are getting increasingly easy to get (full chassis for about 50$), I wanted to have an open discussion on the feasibility of putting an Intel Compute Stick within a Nintendo Switch chassis. I AM WILLING TO ORDER SUCH DEVICE, PLEASE PM ME IF YOU HAVE THE SKILLS & TIME. - Intel Compute Stick motherboard is 12cm long, 3.5cm large and 0.5cm hight (without heatsink). Cold part of the stick will have to be superposed to the battery where the foam is. - Heatpipe will have to be tweaked to be aligned with the CPU (if we decide to keep original shielding / heatpipe / fan). - Option2: Stack up two 3.7v in the remaining battery space and down-step to 5v. - Use the original bezel on top of an HDMI 720p touchscreen. (Which means separate the bezel/glass from the original digitizer then glue it back on an USB touchscreen). - Smallest possible teensy to read the battery and Sound +/- Power buttons. - Use the original controllers with Windows Bluetooth drivers. - Use the original USB-C connector to charge the battery. - Use the original microSD connector. I ordered most of the chassis components and should get them within a month. To making it easier I choose to mount the battery outside. Keep us posted here. The Nintendo Switch chassis is thin as hell. Are you going to use only an external battery to power the device ? As you say the chassis is very thin. To have enought power for the whole device you need two 3,7 batteries in serial and an step down to 5v, and need a lot of space. What about the screen ? What are the elements you picked ? Oh I see, you're using an external battery to power the unit. I was wondering how you'd try to fit everything in.